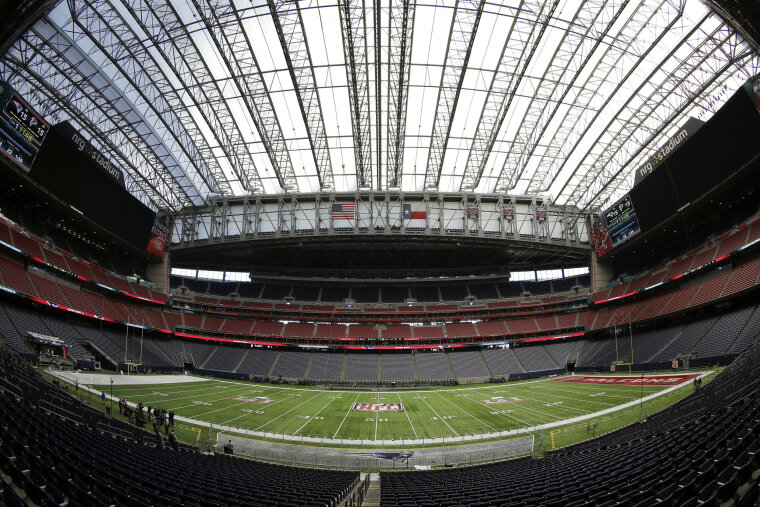 Houston’s NRG Stadium seats around 72,000 screaming maniacs when it’s hosting a football game, as it will on Super Bowl Sunday. But those with their butts in the seats will account for less than one percent of Americans watching the game, most of whom will be planted somewhere in front of a TV, a bowl of guacamole well within reach. But what if they could be there, too? Or come as close to being there as possible, while avoiding the bathroom lines and price gouging that go along with attending any pro sporting event? That’s the promise of virtual reality, which has invaded the sporting world like a blitzing linebacker over the past few years. As camera technology has improved and VR headsets have proliferated, every major sports league (and plenty of minor ones) has experimented with the technology. The NBA broadcasts a weekly game in VR, NASCAR put viewers on the starting line and in the pits at last year’s Daytona 500, the NHL let fans watch from behind the glass at the 2016 All-Star Game, and MLB put them behind the plate during last summer’s Home Run Derby. That leaves the country's most popular sport, the NFL, lagging behind. For now at least. While the league has produced highlights and a YouTube series in VR, it hasn’t yet streamed a game into headsets. But that may change soon. “I believe we’re there for next season,” says David Cole, CEO of NextVR, which produced immersive events for NASCAR and MLB, and streams NBA games. His brand has spent two seasons on NFL sidelines perfecting its technique for filming and producing live games, while grappling with the complicated task of carving out space for more cameras on crowded sidelines “Camera positioning is incredibly important to being able to tell the complete story live and I feel like we’re there with the football,” he says. In November, NextVR got its first chance to show a wide audience what it could do with pro football when the NFL premiered a 10-minute video of big plays from an uninspiring matchup between the 49ers and Cardinals. The game was shot in 180-degree video, allowing fans a chance to relive touchdowns while watching from the back of the endzone. The NFL further forecasted its intention to push into VR when it launched a separate highlights package with Voke, a live VR company recently acquired by Intel. On Thanksgiving, the league debuted a nine-episode behind-the-scenes VR series with Google that took fans onto the practice field, into the weight room, and down the sidelines with a handful of teams. It’s obvious to anyone watching: The NFL, which did not respond to requests for comment, will be broadcasting games in VR very soon. Adoption by America’s most popular sport will be a huge boost for VR, which is still struggling through growing pains. Most obviously, VR headsets aren't yet in many households and sales so far have been disappointing. Meanwhile, the advanced mobile chips that will help change that are only now hitting the market. There’s also a byzantine web of partnerships and exclusivities that users are forced to navigate when accessing VR content. Even with the Google Daydream and Pixel phone used to test the VR sports offerings, I wasn’t able to watch Voke’s highlights, which are only available on Samsung’s platform. Still, these hurdles have done little to dampen expectations of those in the VR industry. One analyst estimate says major sports leagues could be pulling in $4 billion in revenue by 2025, solely through this new technolgy. NextVR’s Cole says he thinks it will be the “dominant component of the digital experience of every major sports league.” And the NBA believes VR could play a major role in expanding an already broad global reach. Right now, the NBA is falling short of that potential. To be sure, watching an NBA game through a headset is a far more immersive experience than watching on wall mounted-TV and it doesn’t require the hassle of going to the game, buying tickets, paying for parking and overpriced beer, and leaving early to beat traffic. But it still fails to capture the true in-person experience. Blame the camera cuts and announcers, which serve as constant reminders that you’re watching a TV show, not a live event. But what if viewers were allowed to choose a seat somewhere in the stands and watch the game from one position, as they would in real life? Voke’s approach is slightly different. Instead of switching cameras for viewers so they can keep up with the game, their platform allows users to take control. “What we’re trying to do is create an entirely new way of engaging sports fans,” David Aufhauser of Intel Sports Group says. “A big part of that is personalization and putting the power to switch cameras in the hands of fans. The ultimate promise of VR is more than just a 360 degree field of vision. It’s a world in which humans can move as they do in the real world, and none of the companies working with the major sports leagues are doing that. But change is coming, gradually. Cole tells me that NextVR is working toward giving users six degrees of freedom. Those looking for true freedom of movement while watching sports in VR can find it in products from companies such as Beyond Sports and Virtually Live. Both build fully immersive experiences that allow the user to move within a virtual world. They’ve done this with European soccer games and auto races, allowing viewers to watch cars whiz by from the infield. Related: Can Virtual Reality Make You a Better Person? With a 360-degree video approach, there’s no doubt fans get an “immersive experience,” says Dilan Shah, VR Evangelist for Virtually Live. “However, taking the same scene and using the Virtually Live approach would allow someone to quite literally travel through the environment. “A broadcast can reach new levels of interactivity with a Virtually Live approach,” he adds. But there’s a tradeoff with that approach: the product looks more like Madden than Monday Night Football. The good news for sports fans, most of whom couldn’t watch this stuff if they wanted to, is that the primary players involved in sports and VR are continually improving their product. NextVR’s Cole says his company is improving resolution and motion acuity, in addition to expanding arc of view. While Voke is building out the realism of its VR experiences with such novelties as a VR t-shirt cannon that would result in the likely XXXL prize being delivered to the home of the lucky fan who caught it. If the improvements keep coming, by the time millions of people actually have the hardware to watch the Super Bowl in VR, the product will be ready for prime time.